IsotropicRank4Tensor — Representations of an isotropic 4th rank tensor. Cij (IsotropicRank4TensorCij) -- Explicit representation in terms of tensor components. Lame (IsotropicRank4TensorLame) -- Isotropic rank 4 tensor in terms of Lame coefficients. E and nu (IsotropicRank4TensorEnu) -- Isotropic rank 4 tensor in terms of Young's modulus and Poisson's ratio. Bulk and Shear (IsotropicRank4TensorBulkShear) -- Isotropic rank 4 tensor in terms of bulk and shear moduli. The IsotropicRank4Tensor represents rank 4 tensor properties which are rotationally invariant, such as isotropic elasticity. The isotropic rank 4 tensor has two independent components, as shown in Figure 6.56. Because the elasticity literature uses many different representations of these two components, OOF2 allows you to enter the tensor in a variety of formats. Structure of an isotropic rank 4 tensor. For an explanation of the symbols, see Figure 6.57. 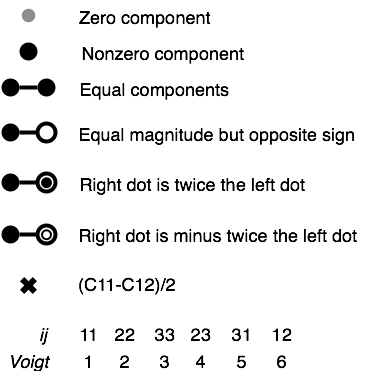 Symbols used in the tensor diagrams. The symmetries of symmetric fourth rank tensors, , allow them to be displayed as second rank tensors, , where is the Voigt notation for and is the Voigt notation for . To keep things simple(? ), the diagrams use Voigt notation for the columns and notation for the rows.